In 1958, the new logo of the company "Three Triangles" first appeared on the red-gray tractors MF 35 and MF 65. Model MF 65 was the representative of a new generation of tractors with a diesel engine - it was equipped with a 4-cylinder Perkins engine with a capacity of 50.5 hp . This engine brought the company Massey Ferguson to the rank of the most powerful tractors of the time. Massey Ferguson not only was a leader in the development of engines, but also made a significant breakthrough in the development of tractor transmissions, in 1962, introducing the Multi-Power transmission. This was the first gearbox in the tractor industry, which allows switching on the go. With the help of a small switch on the instrument panel and without the use of clutch, it was possible to include an increased or lower range for each gear. And 1964 was significant for the launch of the Red Giants, a series of three Massey Ferguson models, including the MF135, MF 165 and brand-new MF 175 tractors. This series, equipped with 45-66 hp engines. And a new hydraulic function that allows to regulate the transfer of weight from the trailed equipment to the tractor itself, has ensured a great international success of the company. In 1972, a powerful modification of the tractor - MF 1250 with a power of 112 hp. Another good news for drivers of tractors of the 1970s was that the company began to pay great attention to the convenience of the cab of tractors. Back in 1969, the standard version of the MF 178 model included a suspension seat, and with the advent of large tractors MF 1200 and MF1250, the driver became much more comfortable and convenient due to a more spacious cabin and a significant reduction in noise levels. And in the new tractors of the MF 500 series, released in 1974, the list of equipment included a powerful heating and ventilation system. To date, MF cabins (for example, tractors of the MF 6400 and MF7400 series) are the highest incarnation of comfort for the operator. He finds himself in a super-silent space where the noise level does not exceed 70 dB (Massey Ferguson was one of the first to overcome the 71 dB threshold). Thanks to climate control, operator's work in any weather will not be tiresome. The "set and forget" air conditioning system ensures optimal distribution of air flows and precise temperature control. In addition to this - excellent visibility glazed cab, convenient rotatable seat on the air suspension with low vibration and double pneumatic lumbar support and located on the armrest controls the machine. Here everything is done for the operator's comfort and safety! The innovative spirit of Massey Ferguson found its continuation in 1978, when the company introduced one of the most significant developments in the tractor industry. This was the launch of the world's first tractor with an electronic control system for linkage and linkage control (ELC). Advanced technology first appeared on the powerful Massey Ferguson MF 1505 model, which was produced mainly for the North American market and had innovative steering and a full wheel drive of the same diameter. By 1985, the new system was also applied to the series of tractors MF 2005 (from 110 to 147 hp). In the following year, a new integrated electronic information system for controlling the hitching mechanism was presented on the "intellectual" tractors of the MF 3000 series with a power rating of 67 to 107 hp. Two variants of the system were available: Autotronic, transmission control system, PTO and coupling, and Datatronic for data collection and performance monitoring. Again, Massey Ferguson left its competitors far behind. The next step in the development of the concept of precision agriculture was the use of GPS satellite communications by the company, which added the function of creating yield maps and the Auto-Guide automatic steering system, increasing productivity and cutting fuel consumption by increasing accuracy and preventing omissions and overlaps. Today, MF tractors are equipped with the best in the industry systems - field and turn control, valve control valves, transport controls, and control system for attachments, closed-center hydraulic systems and a dual-control system for front and rear attachment mechanisms. Therefore, Massey Ferguson tractors are characterized by high precision and productivity, easy operation and reliability. Electronic precision was also used in the development of the innovative Dynashift transmission fitted to the later models of the MF 3000 series. This was preceded by decades of improving the transmission system after introducing the Multi-Power transmission switching technology and the front / reverse gear shifts in the 1980s. 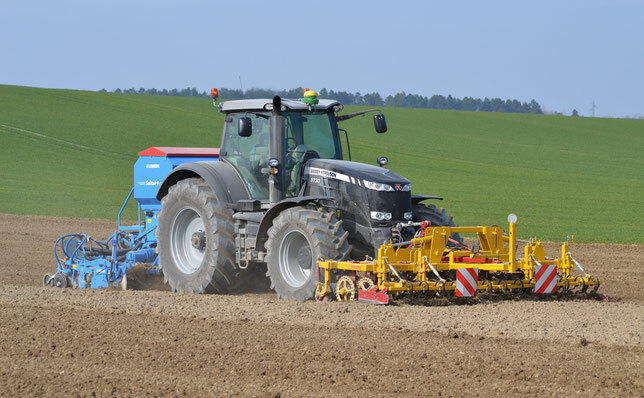 Using the Dynashift system significantly increased the efficiency of the tractor by reducing the percentage of energy absorbed by previous power shifts. The Dynashift system provided the possibility of using a four-speed gearbox with their on-the-fly shifting, without the use of a clutch, in combination with a synchronous gearbox and a front / reverse shift lever. As a result, a 32-speed transmission was obtained, thanks to which a fully loaded tractor accelerated to 40 km / h.
The advanced gearboxes Massey Ferguson Dyna-4, Dyna-6 and continuously variable variator Dyna-VT allow the company to keep the leading position in the production of transmissions today. The Dyna-6 "Eco" gearbox with semi-manual gear shift can be equipped with either Speedmatching or AutoDrive and a maximum speed of 40 or 50 km / h. It is based on four synchronized transmissions, each with a six-speed Dynashift, allowing you to switch on the go without using the clutch pedal. Dyna-VT, installed today on tractors series MF 7400 and MF 8400, allows the driver to choose the best speed for any job, increases productivity and reduces operating costs. 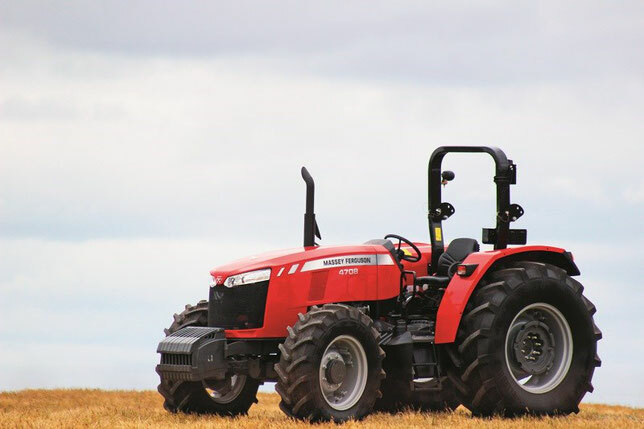 The speed range for field operation ranges from 0 to 32 km / h, while the maximum transport speed is 50 km / h.
In 1994 Massey Ferguson became the property of AGCO Corporation. Since that moment, MF has gained a second wind - from 2003 to 2007, it completely renews the line of tractors, including 12 model lines - from 19 to 315 hp, optimizes and improves the performance of all its machines, and introduces the most progressive new systems in technology.